Whenever I venture to London for a weekend, many of you will know (especially any instagram followers) that I love to venture out and try different restaurants. Nothing excites me more than a breakfast or brunch outing either! Becoming my regular go-to breakfast on a lazy Sunday is Owen's Food Store in Muswell Hill. Not only do they have a most lovely section of organic and health foods - from grains to jams, meat to cheese - they also have a fabulous little cafe/restaurant. I've only been for breakfast but the lunch menu also looks great (as does every plate I have seen dished out!) 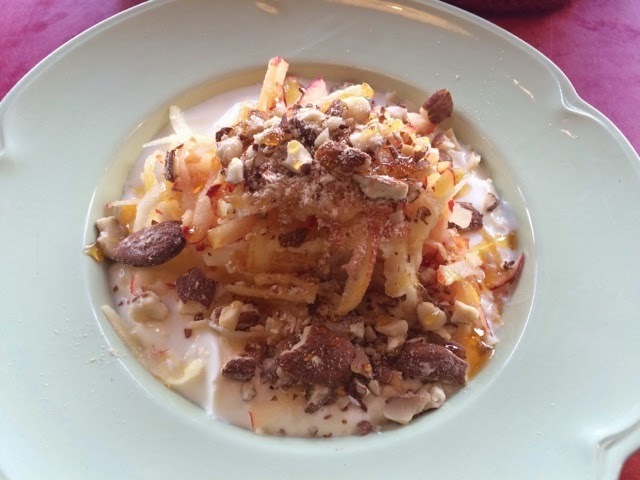 I always opt for their gorgeous natural yoghurt with grated apple, almonds and honey. It's a delicious, healthy AND filling way to start the day. So next time you're thinking about heading out for breakfast (brunch or lunch!) venture to Muswell Hill - you'll avoid the crowds, pay reasonably for delicious meal, be greeted by lovely staff and if I'm honest, will probably end up finding some gems to take home with you from their store.